I absolutely love Hello Kitty and when I was on my search for cute Hello Kitty items I came across Claire's Quirky Crafts! Her shop popped up as she sells these cute handmade cup cosys! 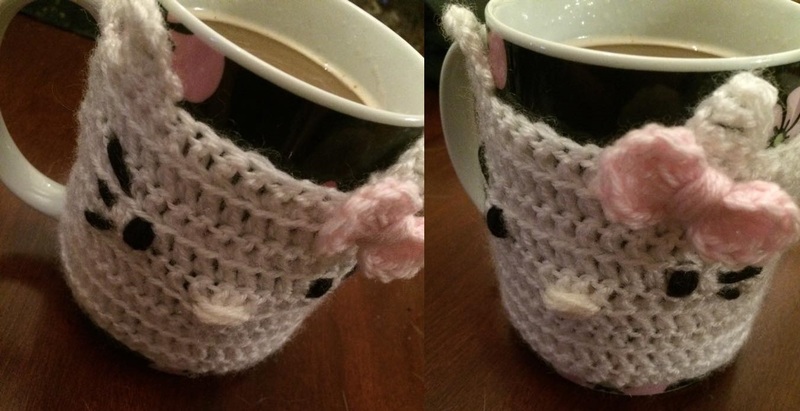 Here's my cosy in action (actually on a Hello Kitty mug). Claire makes them for go-cups and actual mugs. As I asked for mine to be for a mug she made a button fastening to secure the cosy to the handle of the mug. The cosy itself is really cute and it does its job well - it just cheers me up to look at it, it will be lovely to have my brews in on a cold morning when I don't want to leave the house.